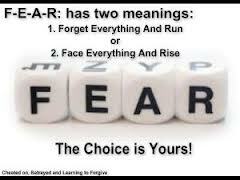 I liked the point about substituting a positive outcome, when fear threatens to stop you before even beginning. The psychological term often heard around this particular sort of paralyzing fear is "projection". As always, your writing is very thought-provoking, and more time is needed to digest everything thoroughly- but I am so happy to know you had not vanished entirely, I could not wait to comment! you still in RPR ? And i promise to write my next post before 2years ;) lol..... i shall not vanish promise. :) i shall go through the link you provided , some fears are so deeply ingrained in our mind that we need some external help medical or proffesssional help is always welcome. Yes its been long time Greig, n i aint in rpr.